.... the mouse shall play. isnt that the old saying? well, my two boys were away this weekend; brian was away with the band, and owen was with nana (b's mom)... and i was home all alone! it was great. at first i was feeling a bit guilty over staying home and having brian's mom watch owen, but i had one big job that i've been wanting to tackle for a few months now. 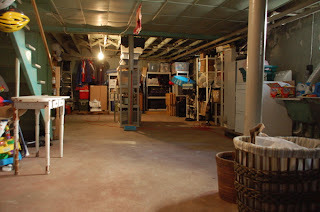 the basement. we are pack rats.... well, i know i am. i've always been one, just ask my mom. and when it's time to clean something, i find the box with the most interesting stuff and sit there and go through all the memories. so instead of it taking me 5 min to sort through the box, i've wasted an hour reminiscing. so i decided that i was NOT going to reminisce. and in a day in a half here is what i accomplished. i refuse to show a before picture because i'm so embarrassed to admit how much junk we had. i took one whole car load to goodwill and we now have 10 boxes of trash outside. basically, now you can see the floor and find anything you might need. so.... thank you so much mom mac and daddy mac for watching owen. i definitely couldnt have asked owen to help me clean.